"It's beginning to look a lot like Christmas..." as the song goes. The eleventh month of 2014 is upon us, as shopping malls and office buildings in Singapore get decorated in anticipation of the year-end holidays and Christmas season. Many shopping malls are getting in on the act early to take advantage of the end of school season and people who would like to do their Christmas shopping early. Even the theme at our Gardens by the Bay already feature Christmas decor and lights to mesmerize its visitors with the colours of the season. On the butterfly conservation and research front, we are encouraged to see more people interesting in butterflies - setting up butterfly gardens and sanctuaries, as well as learning more about butterflies through observing them and photographing them. 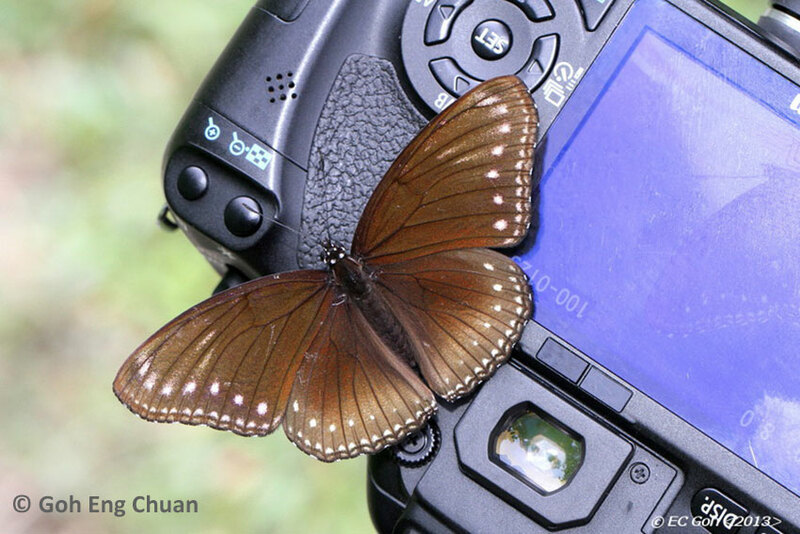 As the Lee Kong Chian Natural History Museum, one of the region's first custom-designed building for a natural history museum readies itself for completion, several exciting initiatives and projects, in collaboration with ButterflyCircle, are in the works. 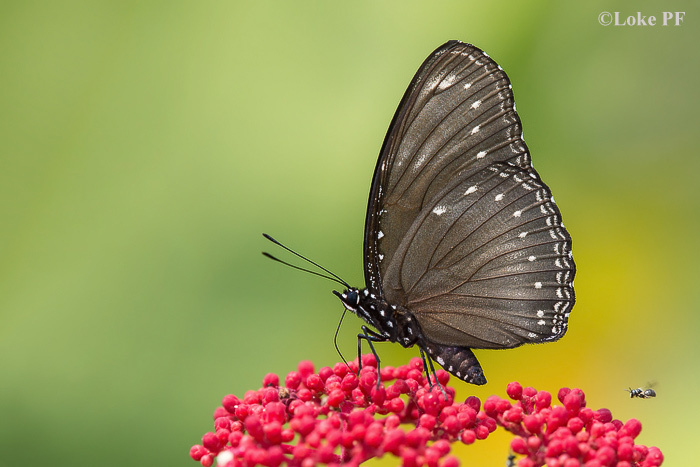 ButterflyCircle members have continued to contribute to conservation initiatives and promoting butterfly-friendly projects in collaboration with the National Parks Board. 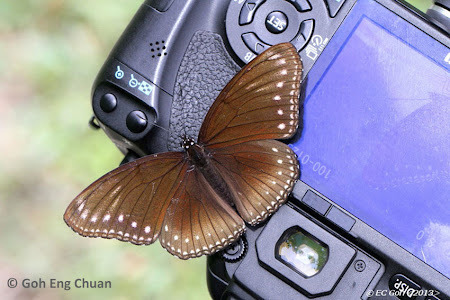 In support of Ubin Day, ButterflyCircle will be conducting a butterfly watching and photography session next Sunday, 30 Nov 2014. The registration for participants is now closed, and we thank all the interested parties for registering and joining us. 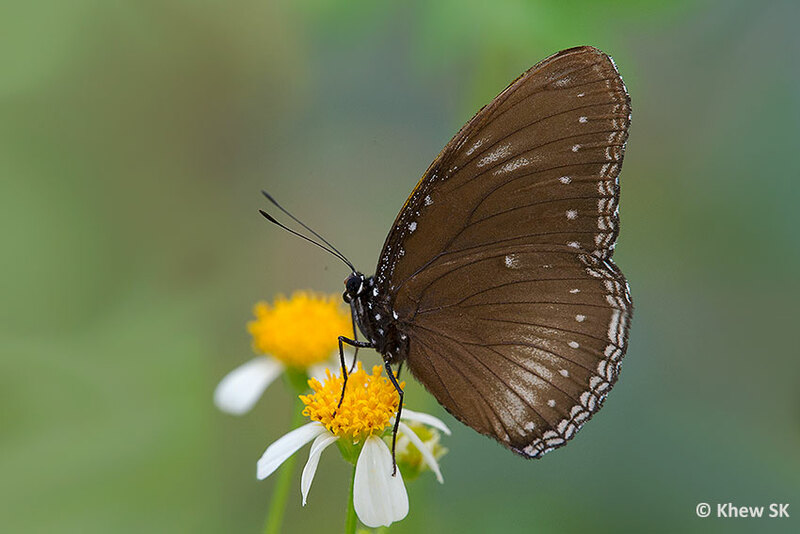 Weather permitting, we hope that you will have an enjoyable morning at Butterfly Hill on Pulau Ubin! 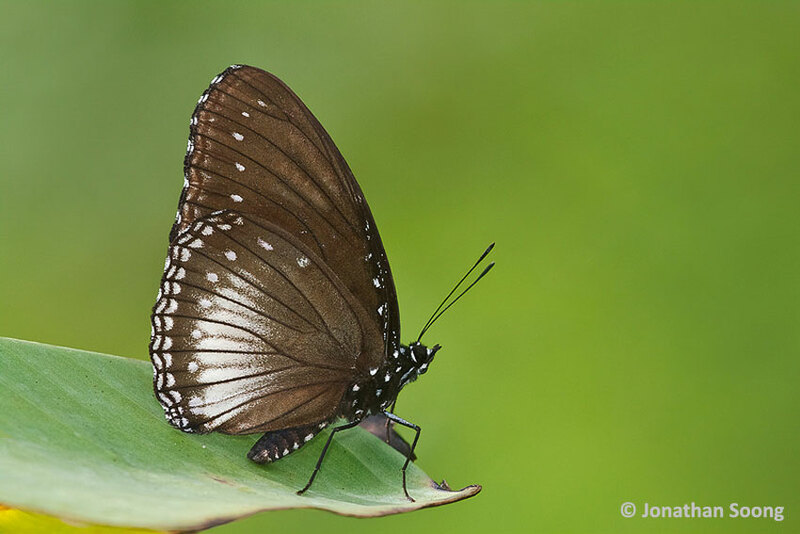 This month, our feature butterfly is the Malayan Eggfly (Hypolimnas anomala anomala). 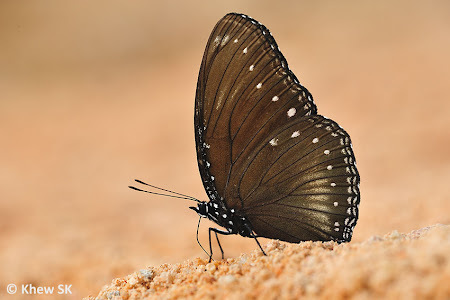 This low-profile and relatively sombre coloured butterfly doesn't usually create much excitement amongst butterfly watchers, when compared to its more colourful and attractive cousins. In fact, it is often mistaken for one of the drab "Crows" from the Danainae family, due to its close resemblance to its distasteful models. 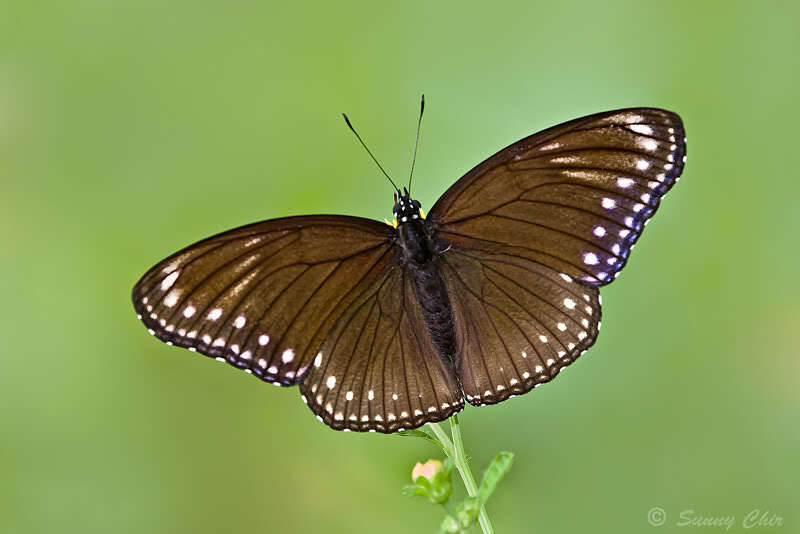 The Malayan Eggfly displays mimetic behaviour, in that it mimics the Crows for protection against predators. 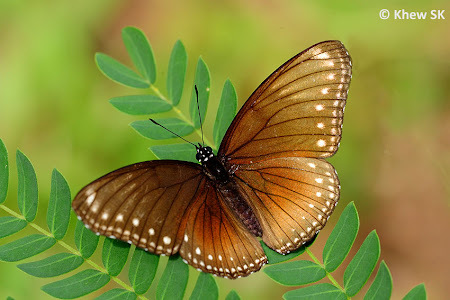 It also flies in an unhurried and slow manner, copying the flight of the Crows to fool predators to avoid them as they would for the distasteful Danainaes. 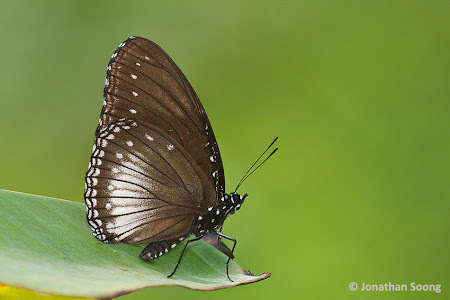 From the number of mis-identifications of this species by beginners and casual nature enthusiasts, we can almost conclude that the Malayan Eggfly is a passable mimic of the Crows (at least from the human perspective!). The Malayan Eggfly is relatively common in Singapore. 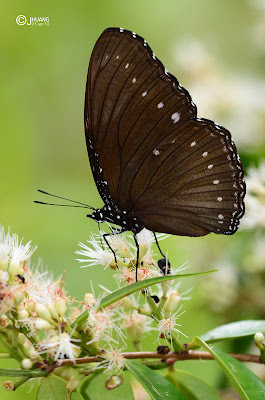 Seasonally, several individuals can be observed together at various locations, particularly in the vicinity of its caterpillar host plant, Pipturus argenteus, a secondary forest bush that grows quite commonly in the forested areas of Singapore. The species is observed to display territorial behaviour - particularly the males. 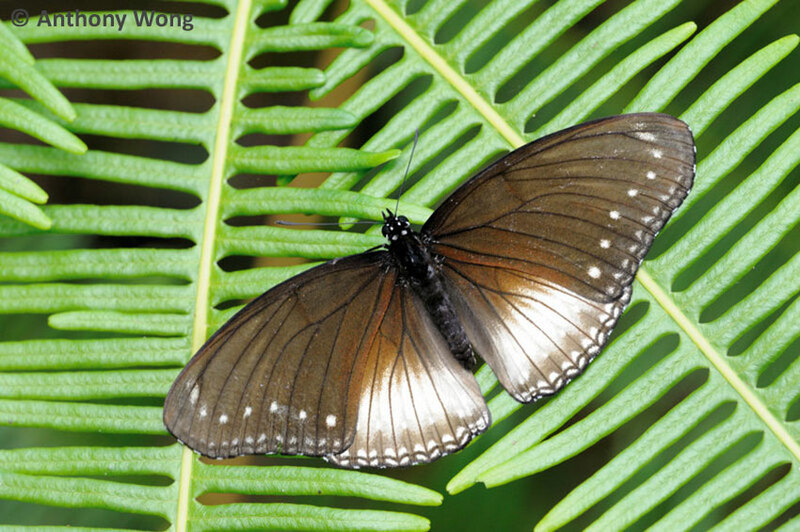 Individuals select favourite perches amongst shrubbery and low foliage, and perch with wings held upright. Whenever an 'intruder' breaches its domain, it will fly out and try to 'attack' the newcomer. At other times, it returns repeatedly to its favourite perches even when disturbed. In the typical form, the Malayan Eggfly is reddish brown on the upperside, with a series of post-discal and submarginal white spots on both wings. The underside is usually darker and bears the white spots as on the upperside. 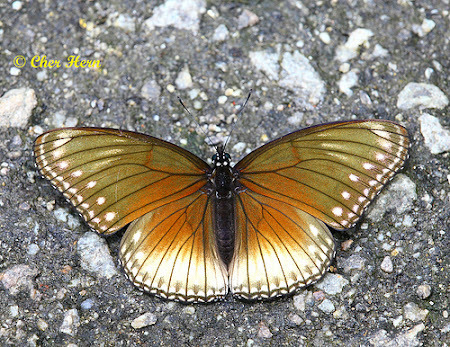 The species is subject to considerable variation in the extent of additional white markings on the hindwings, although two distinct forms are documented for this species. 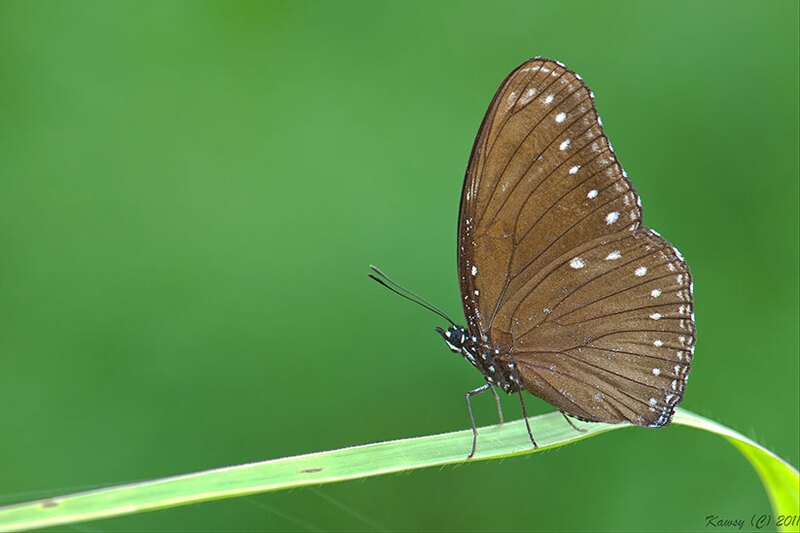 Form-anomala is the typical brown form where the hindwing post-discal area is unmarked, both on the upper- and undersides. 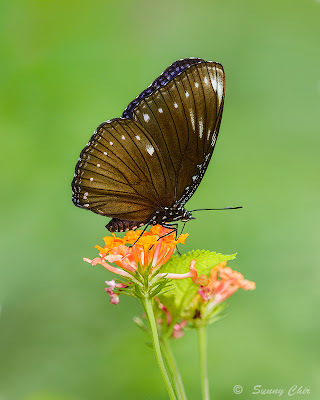 This form is the more commonly observed one, and is quite widespread in distribution, from urban parks and gardens to the forested sanctuary of the nature reserves. 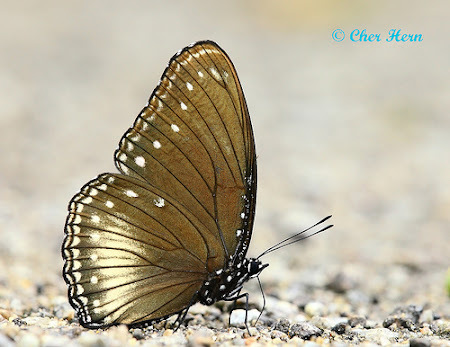 The other form, which is slightly less encountered, features a series of white post-discal streaks on the hindwings. 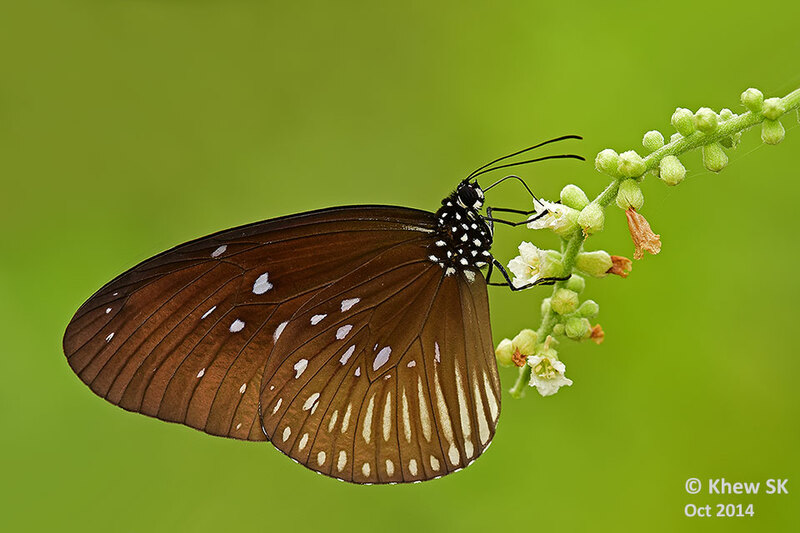 This is form-nivas. Between the two forms, is a wide spectrum of variations from totally no postdiscal markings, to a few obscure streaks, to a prominent white patch on the hindwings. 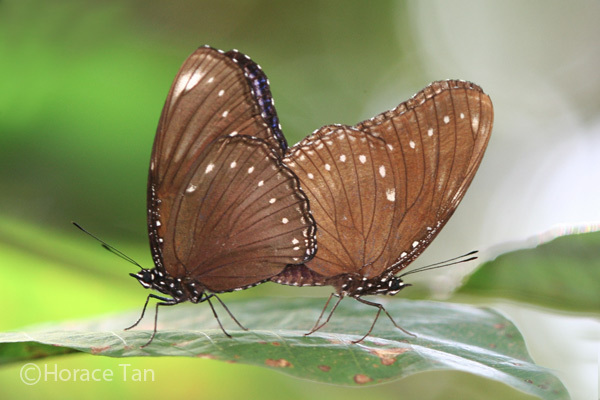 The two forms are passable mimics of the Danainae species that are also found in Singapore - Striped Blue Crow (for form-anomala) and Lesser Striped Black Crow (for form-nivas). 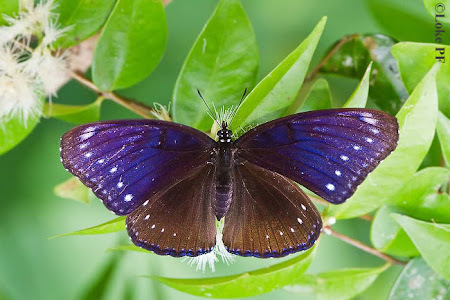 However, not infrequently, a third "form", with iridescent blue forewings on the upperside, is seen. This variant is usually female, featuring the attractive blue forewings and we believe it mimics the male Striped Blue Crow. 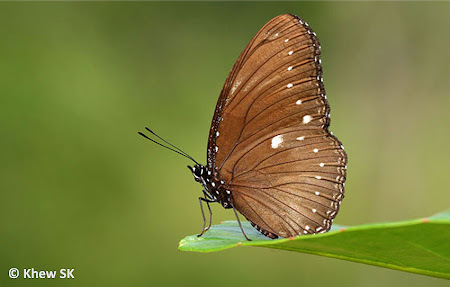 Ecologically, it also makes sense that the female has a series of alternative mimetic strategies to ensure a higher chance of survival to prolong its lifespan to be able to lay as many eggs as possible before it falls prey to a predator or dies of natural causes. However, why this is not considered a different form or documented in any research paper as such, is still not fully understood. 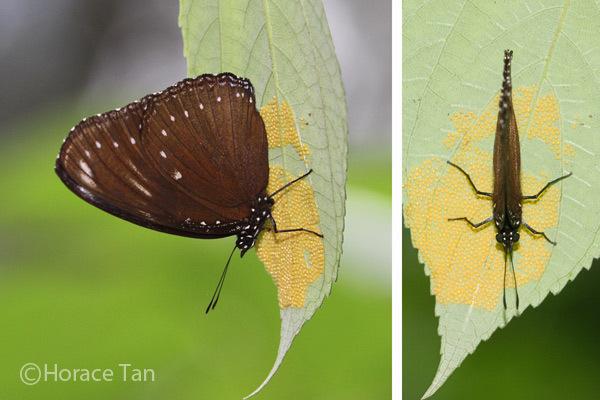 Speaking of egg-laying, the Malayan Eggfly displays a very unique behaviour where the female, after ovipositing from anything between 50 to 100 eggs on the underside of the leaf of its host plant, "stands guard" over the eggs. 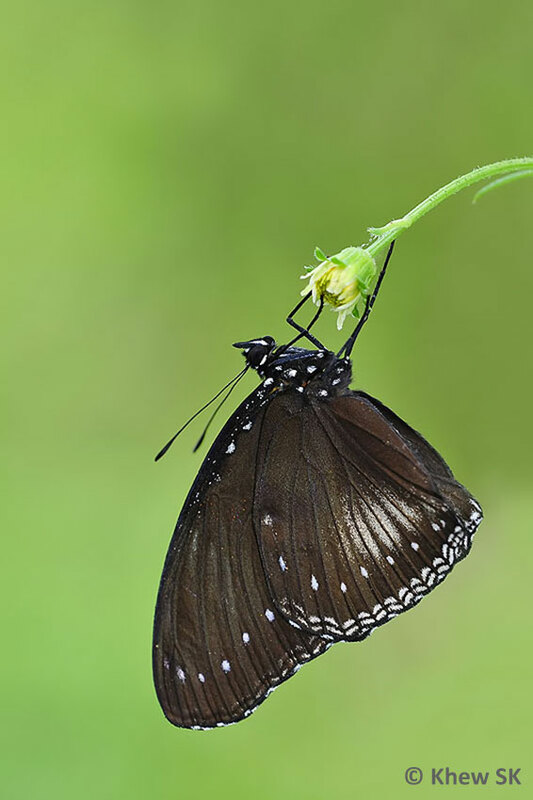 This behaviour has been documented by researchers and papers have been written about it, but it is not really known why the female does that, because a butterfly does not possess the means nor arsenal of offensive weaponry to fend off any potential predators of her eggs. In some instances, the female stands guard over her eggs until the first instar caterpillars hatch and start eating the leaf. 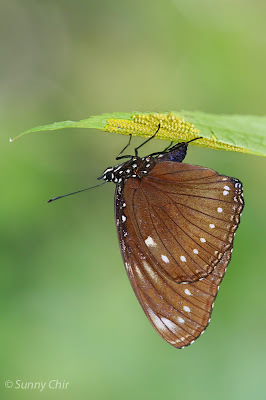 The adult butterfly, in at least two of our observations, died in that position, "protecting" her eggs till her last breath. 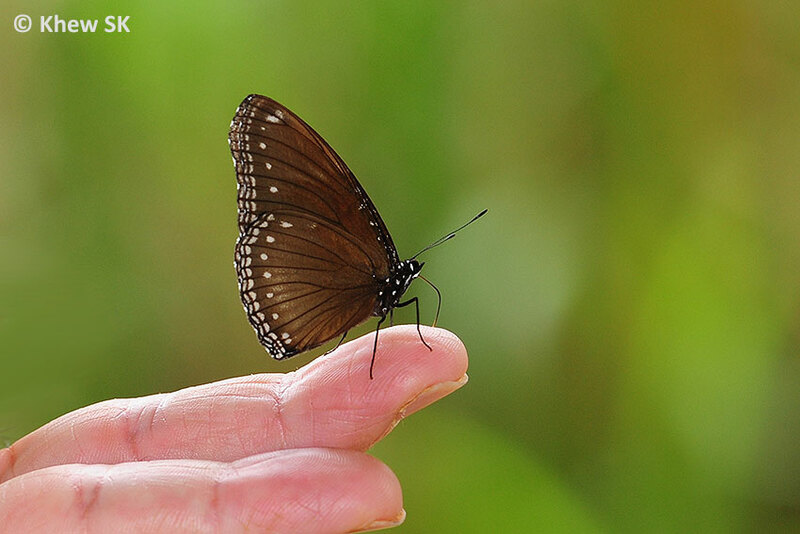 In a controlled environment on one occasion, we physically removed the female butterfly from her perch, only to see it fly back the moment it was released, back to stand guard over her progeny! The Malayan Eggfly has also been observed puddling at sandy streambanks and muddy footpaths. 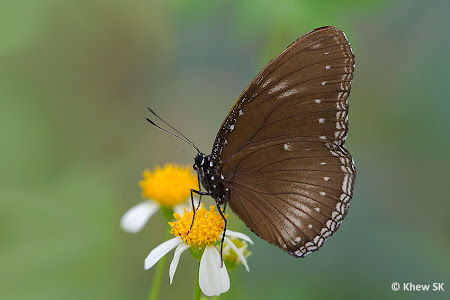 It also has a liking for human sweat and there have been instances where it stays on the hands and arms of ButterflyCircle members, sipping sweat. 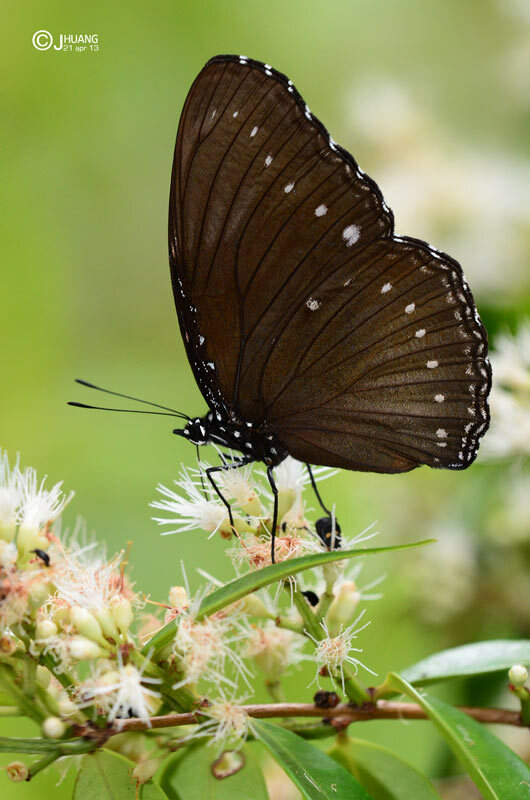 The life history of the Malayan Eggfly has been fully documented here in Singapore, feeding on the caterpillar host plant, Australian Mulberry (Pipturus argenteus). The detailed life history of this species can be found here. Text by Khew SK : Photos by Sunny Chir, Goh EC, Huang CJ, Koh CH, Khew SK, Loke PF, Jonathan Soong, Horace Tan, Nelson Ong and Anthony Wong.